8' Simonis 860å¨ has long been the number one choice for professional tournaments throughout the world. Made in Belgium, Simonis offers superior playability over any other brand in the world. Size: 8' (For Tables With A 44" x 88" Play Surface) How do I measure my pool table? Slightly slower than the #760 Blend. Combed worsted wool, high thread count and higher wool content assure long lasting wear and reduced ball burning. Nap-free - Simonis 860 will not pill, fluff or shed. 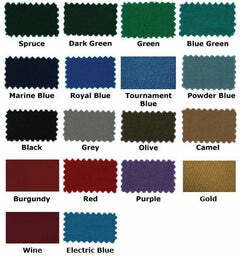 Available in 27 colors: Simonis Green‰ã¢, Blue Green, Petroleum Blue, English Green, Dark Green, Spruce, Powder Blue, Tournament Blue‰ã¢, Electric Blue, Royal Blue, Marine Blue, Gold, Camel, Mocha, Olive, Espresso, Red, Burgundy, Wine, Fuchsia, Purple, Grey, Slate Grey, Black, Chartreuse, Orange, and Burnt Orange. Why worsted construction for pool? Several decades ago, worsted wool cloth was found to be a premium playing surface for carom, snooker and pool. The smooth surface of Simonis worsted wool cloths do not pill, shed or fluff. This design prevents grooves or tracks from forming on the play surface which would negatively impact the roll of the pool ball. Professional play has since turned to worsted wool cloth for the superior accuracy, consistency and durability of the design. How do I protect my cloth and make it last longer?